This paper reconsiders the concept of scale in sport geography. It draws upon fifteen years of teaching practice at the University of Brighton, through its Geographies of Sport and Leisure and Sports Spaces and Places optional modules, to think about the pedagogic importance and limits of working with scale. The paper outlines the evolving curriculum at Brighton, the rationale underlying its lecture series, and provides detail on its forms of assessment. We argue that scalar constructs and categories are necessary though not sufficient elements of a sport geography curriculum. Examples are provided from students’ work of attempts to reach beyond scale, to challenge vertical ontologies and be sensitive to social relations and processes that relate to the moving body in ways that can illuminate contingent and contested power relations and hierarchies present in a range of sport sites, practices and experiences. The paper situates the approach to learning within the ‘Brighton School’ of sport studies and contends that critical pedagogies and social research on sport requires a sustained interrogation of the ‘politics of scale’ to expose relations of social power. We contend that teaching sport geography should be both an exercise in critical interpretivist learning as a prelude to potential ‘critical proactivist’ interventions leading to progressive social transformation. Watery pasts and the constellation of the canal, RGS-IBG annual conference, London, 1 September 2017. Heritage trails are an important route into accessing the histories of waterways. They are a multifaceted tourist product, combining a series of complex environmental, economic and cultural policy objectives, and are increasingly used by communities and public agencies as a tool encourage recreational use along linear corridors. This paper seeks to open a discussion about the use of heritage trails and the processes of heritigisation by thinking about the archival qualities of the canal. It reflects upon research carried out as part of the AHRC-funded ‘European Waterways Heritage’ project, which (through its UK case study) has produced a new 5km heritage trail for the Ashton Canal in Greater Manchester. The paper considers what happens during a process of historical reconstruction and rehabilitation of cultural heritage when a canal is found to be layered in the unspectacular – lacking any special, historical, technical or aesthetic attributes. Using Walter Benjamin’s (1999) concepts of the ‘trace’, ‘flash’ and ‘constellation’, alongside cultural geographic readings of post-industrial atmospheres, I seek to think with the water in a way that suspends an “indexical imaginary” (van Wyck, 2010) and which encourages a deeper embodied engagement with our surroundings, its happenings and incidence. The paper thus has implications for how we write and construct heritage trails, facilitate new user experiences, and deepen forms of public engagement about our watery pasts. American Association of Geographers annual conference, Boston, USA, 6 April 2017. In recent decades, there has been widespread faith in 'heritage' as a driver of regeneration in post-industrial areas. There are a number of successful examples of its use in towns and cities worldwide, which are held up as models for subsequent projects (Brownill 2013). Though these schemes may be carefully thought-through, the possibilities and implications of these recent, instrumental uses of heritage have not been critically examined as a phenomenon. Specifically, how heritage might operate in an unequal cultural and economic landscape. This paper reports on a two-year project, examining the uses of canals as material heritage assets, to power development and regeneration agendas in the former industrial areas along the Rochdale and Ashton Canals, in the North of England. Concentrating on the regeneration of the former industrial suburbs of Manchester, this paper conceives of heritage as a cultural engine, which is expected to deliver added value of various kinds, through a processing of the appropriate 'heritage assets'. We report on our audit of the assets, material and cultural, which are being used to power the process, and ask whether multiple similar industrial buildings and other structures, many now razed to the ground, enough to power this heritage-led regeneration, and what their use can tell us about the process of heritage. We also ask , from 'Condition of England' novels to the 'Madchester' music scene, what are the cultural representations of canals and canalside places, which shape the ways that these material assets can be understood as 'heritage'? Leisure Studies Association annual conference, Liverpool John Moores University, Liverpool, 7 July 2016. There is a growing literature on the importance of localised knowledge and experiences to the management and futures of waterscapes. We seek to add to these discussions by thinking about acute challenges faced by water environments in the coming decades and the importance of community engagement and knowledges in two key areas; responses to climate change impacts and the disappearance of community heritage and traditions in relation to water environments. We will outline two projects currently being undertaken, Community Responses to Changing Water Environments, supported by the Daphne Jackson Trust, and the AHRC-funded European Waterways Heritage project. Both projects explore localised knowledges and experiences of changing water conditions and the connection of communities to waterscapes. We will reflect upon the nature of qualitative community-oriented research being pursued in these projects and will outline the methodologies utilised to engage the public in caring for and understanding water environments and will detail how the projects are contributing to reframing how societies use and value water. Institute of Historical Research, Sport and Leisure History seminar, London, 16 May 2016. Heritage trails are an important route into accessing the histories of seaside resorts and communities. They are a multifaceted tourist product, combining a series of complex environmental, economic and cultural policy objectives. Trails are considered not just as a means to learn about the history of place but are located within a cultural politics of destination marketing and geographical imaginaries that spatialise the cultural heritage of place in different ways, emphasising local, transnational and global ‘claims to fame’. This paper offers a critical overview of UK seaside heritage trails and suggests new ways in which we might approach the heritage trail as a form of recreational ‘prosumption’. Political Studies Association Sport and Politics Group 10th annual conference, Bournemouth University, 4 March 2016. The history of lifestyle sport is replete with interventions to manage practice and to mitigate potential risks for both participant and public authorities. A large body of literature has provided insights into the forms of management and regulation that accompany the construction of purpose-built facilities, revealing the efforts to influence safe behaviour and to construct particular regimes of conduct. More recently, critical scholarship has shown neoliberal governmental rationalities at work; transforming ‘deviant’ street participants into pliant ‘good citizens’ through involvement in the planning, consultation and management of facilities, particularly skateparks. The role of law and regulation within countercultural sports is under-researched, although the role of law in relation to (un)popular cultures is often problematic. Within the practice of parkour we are also beginning to see signs of the onset of juridification (including the emergence of rules, national governing bodies, training courses, etc.). This paper considers a significant aspect in the emerging regulatory frameworks that accompany the construction of purpose-built facilities for lifestyle sport: the regulatory regime and the information sign. Based upon ethnographic visits and observations conducted at twenty parkour parks and training facilities throughout the UK, we show how signs can be read as an attempt to pursue moral and somatic projects, linked closely to participatory philosophies emanating from particular facilities. Signs are read as part of the material assemblage of regulation, instructing participants on how to negotiate the facility, as well as extolling different visions of bodily engagement and discipline. The sign lays down prescriptive and proscriptive boundaries for action; defining possibilities as well as suggesting constraints to practice. We seek to show that signs are not primarily a clarification of legal and public responsibilities for health and safety, or a vestige of paternalistic oversight, but are intrinsic to how lifestyle sportscapes are defined by participants, sponsors, facility providers and local authorities. Signs are important material texts that provide evidence of the multifaceted regulatory framing of an increasingly popular informal sport. This paper surveys a transition in the culture of climbing and the attribution of heroic reputation set within the context of the corporatisation of mountain environments and the rise of celebrity culture. One of the key developments in the public celebration and discourse of climbing and mountaineering challenge has been the rise of charity projects and spectacles. In particular, I argue that since the mid-1990s we have witnessed the emergence of the climber as ‘celanthropist’ (Rojek, 2013) – a figure that has come to public prominence on behalf of charitable causes and through which significant para-social relationships are formed between the climber and the public. Two aspects are considered: a hyper-individualised mediation of an ‘inner journey’ as the climber seeks emotional and financial support as they overcome personal trauma and illness through their setting and achievement of a climbing challenge. Secondly, the rise of the ‘charity mountaineer’, a have-a-go hero who takes part in a climbing challenge on behalf of a charitable organisation in order to leverage funding and media attention both for themselves and the charity. The cases of Annabelle Bond’s Seven Summits attempt and Comic Relief’s 2009 ‘Kilimanjaro: the Big Red Nose Climb’ will be discussed. The term ‘counterculture’ is frequently applied to describe a distinctive feature of the history, politics, style and organisation of sport. As an analytical category it is elusive, yet the idea of ‘counterculture’ or a ‘countercultural’ legacy is perpetuated in studies of youth subcultures and lifestyle sport, in an often simplistic and a priori fashion. I argue that ‘counterculture’ has tended to be applied selectively in interpretations of lived practices and popular cultural forms, though there is a need to better understand its conceptual parameters and analytical significance to the study of sport cultures. This paper looks at the origins of the concept in sociological and political thought from the 1950s and details socio-historical contexts where the concept has been most pronounced, looking at the countercultural sports pioneered by the New Games Movement in the 1970s, in particular. It concludes by reappraising ‘counterculture’ in relation to the study of new or hybrid sport forms in the city within evolving ‘countercultural spaces’ which prefigure new political and social relations. Heritage trails are an important route into accessing the histories of seaside resorts and communities. They are a multifaceted tourist product/experience, combining a series of complex tourism policy objectives around economic and cultural development. Trails are considered not just as a mechanism to historical learning about place but area located within a cultural politics of destination marketing and geographical imaginaries that spatialise the cultural heritage of place in different ways, emphasising local, transnational and global ‘claims to fame’. This paper offers a critical overview of UK seaside heritage trails, based upon a mixed method qualitative study which included participatory research, site visits and a content analysis of trail brochures, leaflets, signage and web materials. A typology of seaside heritage trails is provided, to account for different social, political and economic objectives inherent in the proliferation of this significant coastal leisure product. Parkour and urban politics: citizenship and the 'gift', ESRC seminar on Lifestyle and Informal Sport, Brighton, 25 April 2015. A presentation on the proliferation of parkour training areas and purpose built facilities in the UK, drawing on a series of interviews with participants, local authorities and facilities providers, as well as ethnographic visits to parkour parks throughout the UK. ﻿﻿﻿Introducing the ‘Collaborative Stories Spiral’: a participatory methodology for creating transformational community history projects﻿﻿﻿, Pararchive Project Conference, University of Leeds, 27 March 2015. Working as a team comprising academics and a research-experienced Community Partner, LGBT Youth North West, we have been collaborating on a range of participatory research projects. Many of these projects have involved the generation of community histories (often of food growing communities) through participatory oral history work and related methods. Our projects have produced rich data, and a range of compelling outputs, including YouTube films, storyboards, talking patchwork quilts, print on demand books, and associated exhibitions. Yet, as we undertook these projects together, we have been struck by the absence of an over-arching methodological framework, analogous to PAR in the social-sciences, but which was tailored to the process of creating community stories together. In an attempt to address this we have developed the Collaborative Story Spiral (CSS) as a conceptual framework which guides and supports collaborative teams through the recursive four stage spiral process of (i) situating stories (ii) generating stories and (iii) analysing stories (iv) remediating stories. We have been conceptualising the CSS as a ‘boundary object’ (Star 2010), which allows for flexible structures, including models which do not involve (so much) academic mediation. We are particularly interested in the multiple movements and transformations of data and outputs and in what happens once community stories are remediated in a range of forms, eg academic report to website and archive and community artwork. In conceptualising our approach we also draw on Haraway’s work on story transmission as a game of ‘cat’s cradle’ (1994) and King’s attention to ‘transmedia ecologies’ (2012), to offer a model of research which allows ‘interpretative flexibility’ about the shared project, and which is open to and recognises the multiple ways in which collaboratively produced stories work and are worked on in the world, and continue to do so beyond the life of funded projects. We will draw on a range of our projects in outlining our methodology and our aim is that it will be transferable, and that others will take it up and find it useful. ﻿Sport stadia, seaside economies and social tone: the history of the Hastings and St Leonards greyhound racing track, ﻿, Rec, , , Recording Leisure Lives: Places and Spaces of Leisure in 20th Century Britain, the Mass Observation Archive, The Keep, Sussex, 31 March 2015. Greyhound racing was a successful American sporting import to interwar Britain and by the late 1930s having a flutter at 'the dogs' was the third largest leisure expenditure. Not all communities, however, were responsive to the sport and its 'undesirable' clientele. This paper explores the history of the Hastings and St Leonards greyhound racing stadium. It focuses on the local politics surrounding the planning application for the stadium, and the campaigns and discourses mobilised to obstruct the stadium’s construction. The presentation draws upon original documentary evidence relating to the emergence of the stadium through which it is possible to identify aspects of class, religion, and entrepreneurialism, at work in the community reaction to greyhound racing. The history of the stadium to the developing historiography of seaside towns and specifically ideas of social tone that constructed a sense of place to the resorts of Hastings, St Leonards and Bexhill. Songs from the sailorhood: Robert Gilchrist, 'Bard of Tyneside', Broadside Day, 21 February 2015, Cecil Sharp House, London. Organised by the English Folk Dance & Song Society and Traditional Song Forum. 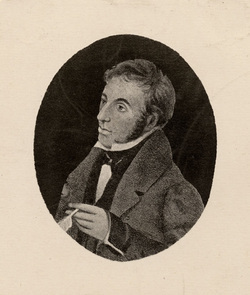 Robert Gilchrist (1797-1844) was one of the celebrated Tyneside songsters of the early nineteenth century, whose verse was well known regionally. 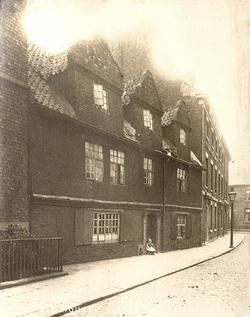 This presentation reveals some important archive findings from a project entitled 'Songs from the Sailorhood' which looked into Robert's life as a sailmaker, poet and balladeer, set in the context of the historical geographies of song culture on Newcastle's Quayside. 'Countercultural' sport: reappraising a political trope, Political Studies Association's Sport and Politics Group 9th annual conference, Durham University, 7-8 January 2015. The term ‘counterculture’ is frequently applied to describe a distinctive feature of the history, politics, style and organisation of sport. As an analytical category it is elusive, yet the idea of ‘counterculture’ or a ‘countercultural’ legacy is perpetuated in studies of youth subcultures and lifestyle sport, in an often simplistic and a priori fashion. I argue that ‘counterculture’ has tended to be deployed as a political trope, applied selectively in interpretations of lived practices and popular cultural forms, though there is a need to better understand its conceptual parameters and analytical significance to the study of sport cultures. This paper looks at the origins of the concept in sociological and political thought from the 1950s and details socio-historical contexts where the concept has been most pronounced. It concludes by reappraising ‘counterculture’ in relation to the study of new or hybrid sport forms in the city, which prefigure politics within evolving ‘countercultural spaces’. Heritage trails and coastal regeneration: looking beyond the local, Heritage, Local History and Regeneration one day conference, October 15 2014, University of Brighton Hastings. 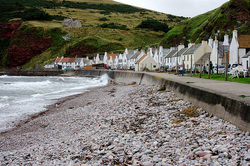 A critical overview of heritage trails in UK seaside communities and resorts. Focuses on cartographic and social challenges and identifies where local authorities and historians could work more profitably and professionally. 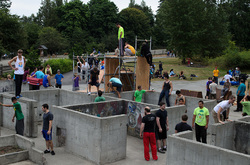 Sport, youth culture and public space: parkour parks as an 'everyday utopia', Leisure Studies Association annual conference, University of the West of Scotland, Paisley, 7-9 July 2014. This paper examines public space as a domain in which social values are asserted and contested. It focuses in particular upon research into the development of parkour parks and training spaces in the UK, undertaken through a mixture of qualitative interviewing with participants and stakeholders (n=35) and ethographic visiting of key sites (n-10). Rather than viewing parkour parks as discrete, spatially bounded units and a manifestation of regulatory practices and youth development policies, this paper seeks to shed light on how the spaces are materialised and imagined by users and participants as 'everyday utopias' (Cooper, 2013). The term 'utopia' is deployed here not uncritically, for research has shown inqualities and exclusions occur within the parkour subculture (Wheaton, 2013), but instead I seek to shift the theoretical lens to the park itself as an evolving space of social invention and careerist aspiration. The paper reveals how parkour parks are constructed by users as enfolded in networks, mobilities and possibilities; where the 'everyday utopias' are at once 'glocalised' manifestations of neoliberal entrepreneurialism and an expression of 'creative citizenship'. I conclude with some thoughts about the individual and social dynamics at work in the 'everyday utopias' of parkour parks and the tensions and contradictions that emerge. Sport, youth culture and public space: parkour parks as an 'everyday utopia', PSA Sport and Politics Study Group 8th Annual Conference. Liverpool John Moores University, February 2014. This paper examines public space as a domain in which social values are asserted and contested. 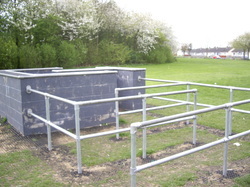 It focuses in particular upon research into the development of parkour parks and training spaces in the UK. Rather than viewing parkour parks as discrete, spatially bounded units and a manifestation of regulatory practices and youth development policies, this paper seeks to shed light on how the spaces are materialised and imagined as ‘everyday utopias’ (Cooper, 2009). The term ‘utopia’ is deployed here not uncritically, for research has shown inequalities and exclusions occur within the parkour subculture, but instead I seek to shift the theoretical lens to the park itself as an evolving space of social invention and prefigurative aspiration. The paper reveals how parkour parks are constructed by users as enfolded in networks, mobilities and possibilities; where the ‘everyday utopias’ are at once ‘glocalised’ manifestations of neoliberal entrepreneurialism and an expression of ‘creative citizenship’. It concludes with some thoughts about the individual and social dynamics at work in the ‘everyday utopias’ of parkour parks and the tensions and contradictions that emerge. Connecting food growing communities through creative research practices. Presentation to the Brighton and Sussex Universities Food Research Group, Tablehurst Farm, Forest Row, East Sussex, 16 March 2013. This presentation will explore how creative research practices were employed in an AHRC-funded research project to connect communities involved in food growing. The potentials and problems of creative methodologies will be addressed. The leisure identity of the labouring-class poet: reflections on the works of Robert Gilchrist, 'Bard of Tyneside'. Presented at the Leisure Studies Association Annual Conference, July, Salford. Labouring-class poets comprised a parallel tradition in British literature. Between 1700 and 1900 it is estimated that over 1,300 poets from lowly backgrounds were producing verse, poems, ballads and song; forms of cultural production essential to the formation of working class consciousness and to the development of regional cultural identities. Within the growing historiography on the labouring-class poet and cultural production in provincial Britain is an interest in the struggles such poets faced between their social location and poetic aspirations. This paper seeks to shed further light on this tension by providing a case study into a neglected labouring-class poet, Robert Gilchrist (1797-1844), a sailmaker, poet and songwriter from the North-East of England. It considers poetry-making and lyrical composition as a revealing, if a highly fraught, site of labouring-class expression. Robert Gilchrist's complex and dynamically dialogic identity is revealed through a selective textual analysis of key works and audience reaction, to show how the (pre)tensions of the labouring-class poet were negotiated through choice of language, subject and imagery. In so doing, the pervasive insistence on radical resistance and class formation in the history of working-class cultural production is challenged through a more sustained focus upon leisure and poetic identity, civic consciousness and the pleasures of writing. The paper will conclude, heeding the post-structuralist injunction of Patrick Joyce in the study of class cultures, by arguing of the need for leisure historians to engage with scholars of English literature in order to develop deeper insights into leisure practices and spaces crucial to the making of the cultures and identities of labouring people in the early nineteenth century. 'Hail, Tyneside lads in collier fleets': song culture, sailing and sailors in North-East England. Presentation to the Port Towns and Urban Cultures conference, Portsmouth, July 2013. 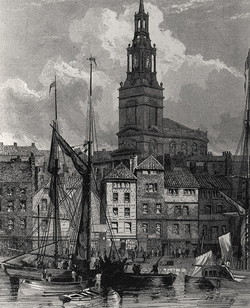 Newcastle's quayside was one of the largest wharfs in Nineteenth-Century Britain and the North-East region depended upon the trade networks of merchant sailors for its economic prosperity. The sailors and keelmen of the 'kee' were local characters, extensively recorded in North-East verse and ballad throughout the Nineteenth-Century. This paper considers the song culture as an essential part of the popular entertainments enjoyed by Tynesiders and an important source for the study of the interactions between men and sailing, and the relationships between the everyday experiences of life in a port town and life at sea. The first part provides a broad discussion of the representation of sailors in Tyneside verse in the early Nineteenth-Century. It then offers an overview of poetry and song written by those involved in maritime trades. In particular, it focus upon the work of sailmaker poet Robert Gilchrist (1797-1844), to date a neglected poet and songwriter, whose verse spoke to the cultural and economic impact of sailing on the local community. Through a selective textual analysis of key works that dealt with sailors, sailing and the dangers of the sea, the paper will show how sailors enjoyed a dual position from local versifiers, as both object of attachment and patriotism whilst also being subject to comic description and satire. As such, it provides an insight into the importance of poetry-making and song culture in shaping the representations and social attitudes towards sailors on Tyneside. Theorising Worzel: the scarecrow, gift exchange and geographical imaginations. Presentation to the RGS-IBG annual conference, London, August 2013. The scarecrow is a ubiquitous figure in the “symbolic countryside”. It is primarily identified by its contribution to agricultural production, but has been increasingly employed in recent years by rural communities eager to attract visitors and new businesses to their villages by hosting scarecrow festivals. Given its potential to inform at some level on transitions from productivist to post-productivist rural economies, it is surprising to find that the scarecrow has received scant consideration by rural and cultural geographers. This paper offers a series of thoughts on how to theorise the scarecrow. The first part concerns how the ‘geographical imagination’ can be utilised to approach a seemingly familiar and unremarkable object to inform on a range of issues and debates current in cultural geography; from human and non-human relations, to transformations in agricultural economies, to the geographies of waste. Moving beyond a static agricultural functionality, the second part of the paper offers a richer theoretical consideration of the scarecrow by returning to anthropological studies of fertility rites and gift economies. We explore the ways in which the scarecrow is involved in gift relationships between people, nature and the land and evaluate its potential to connect food growing communities in diverse rural and urban settings. We argue that the scarecrow can become an important signifier of community identity, crafted to provoke conversations about people-environment relations. The literary tourist trail and the genealogical imaginary: in the footsteps of Robert Gilchrist, 'Bard of Tyneside'. Presentation to the British Society of Sport History South of England Sport and Leisure History Network, University of Sussex, 26 October 2013.
about the process of the construction of a literary tourist trail. This paper reflects upon an attempt to create a new literary tourist trail associated with an early nineteenth-century poet and songwriter, Robert Gilchrist (1797-1844), ‘Bard of Tyneside’, my 3 x great-grandfather. I reflect upon the choices concerning the selection of locations related to the literary output and biography of Robert Gilchrist and provide some preliminary thoughts on the role of family history research in creating new ‘place imaginaries’ associated with kinship and identity. At a more theoretical level, this paper contributes to scholarship on literary pilgrimages by reflecting upon how notions of nostalgia, value, authenticity and place inform the selection of locations.